1. Galilei, Galileo (1564-1642). Sidereus nuncius. -- Venice: apud Thomam Baglionum, 1610. 2. Galilei, Galileo (1564-1642). Sidereus nuncius . -- Frankfurt: in Paltheniano, 1610. 3. Schyrleus de Rheita, Antonius Maria (1597-1660). Oculus Enoch et Eliae, sive Radius sidereomysticus . -- Antwerp: Ex officina typographica Hieronymi Verdussii, 1645. 4. Fontana, Francesco (1602-1656). Novae coelestium terrestriumq[ue] rerum observationes . -- Naples: apud Gaffarum, 1646. 5. Hevelius, Johannes (1611-1687). Selenographia: sive, Lunae descriptio . -- Gdansk: Autoris sumtibus, 1647. 6. Divini, Eustachio (1610-1685). "Lunae facies," plate 19 in: Guericke, Otto von . Experimenta nova . -- Amsterdam: apud J. Janssonium a Waesberge, 1672. 7. Riccioli, Giovanni Battista (1598-1671). Almagestum nouum . -- Bologna: ex typographia haeredis Victorij Benatij, 1651. 8. Hooke, Robert (1635-1703). Micrographia . -- London: Printed by Jo. Martyn and Ja. Allestry, 1665. 10. Eimmart, Georg Christoph (1638-1705). "Genuina Corporis Lunaris Facies," plate 1 at p. 40 in: Zahn, Johann . Specula physico-mathematico-historica , vol. 1. -- Nuremberg: sumptibus Joannis Christophori Lochner, 1696. 11. Bianchini, Francesco (1662-1729). Hesperi et Phosphori nova phaenomena sive Observationes circa planetam Veneris . -- Rome: Apud Joannem Mariam Salvioni, 1728. 12. Mayer, Tobias (1723-1762). Bericht von den Mondskugeln . -- Nuremberg: Zu finden in der Hom nnischen Officin, 1750. 13. Mayer, Tobias (1723-1762). Opera inedita . -- Göttingen: Johann. Christian. Dieterich, 1775. 14. Schröter, Johann Hieronymus (1745-1816). Selenotopographische Fragmente sur genauern Kenntniss der Mondfl che [vol. 1]. -- Lilienthal: auf Kosten des Verfassers, 1791. 15. Lohrmann, Wilhelm Gotthelf (1796-1840). Topographie der sichtbaren Mondoberflaeche . -- Dresden: Auf Kosten des Verfassers, 1824. 16. Beer, Wilhelm (1797-1850); and Mädler, Johann Heinrich (1794-1874). Mappa selenographica . -- Berlin: Apud Simon Schropp & Soc., 1834. 17. Schmidt, Johann Friedrich Julius (1825-1884). Der Mond . -- Leipzig: Verlag von Joh. Ambr. Barth, 1856. 18. De La Rue, Warren (1815-1889). "On a photo-engraving of a lunar photograph," in: Monthly Notices of the Royal Astronomical Society , vol. 25, p. 172 and plate. -- London, 1865. 19. Rutherfurd, Lewis Morris (1816-1892). "Third Quarter, Sept. 16, 1870," [lunar photograph] facing p. 230 in: Proctor, Richard A . The Moon . -- New York: D. Appleton and Co., 1873. 20. Nasmyth, James Hall (1808-1890); and Carpenter, James (1840-1899). The Moon : Considered as a Planet, a World, and a Satellite. -- Second edition. -- London: John Murray, 1874. 21. Nevill, Edmund Neville (1851-1940). The Moon and the Condition and Configurations of its Surface / by Edmund Neison. -- London: Longmans, Green, 1876. 22. Schmidt, Johann Friedrich Julius (1825-1884). Charte der Gebirge des Mondes . -- Berlin: In Commission bei Dietrich Reimer, 1878. 23. Lohrmann, Wilhelm Gotthelf (1796-1840). Mondkarte in 25 Sectionen und 2 Erl uterungstafeln / Herausgegeben von Dr. J.F.Julius Schmidt. -- Leipzig: Verlag von Johann Ambrosius Barth (Arthur Meiner), 1892. 24. Selenographical Journal. A monthly bulletin of the Selenographical Society . vol. 1-5, April 1878 - December 1882. -- London: Warren Hall & James J. Lovitt, 1879-1883. 25. Mayer, Tobias (1723-1762). Tobias Mayer's grössere Mondkarte nebst Detailzeichnungen . -- Göttingen: Univ.-buchdr. von E.A. Huth, 1881. 26. Weinek, Ladislaus (1848-1913). "Selenographical Studies, based on negatives of the Moon taken at the Lick Observatory," in: Publications of the Lick Observatory , vol. 3, pp. [v-viii], 1-130. -- Sacramento: State Office, 1894. 27. Krieger, Johann Nepomuk (1865-1902). Mond-Atlas. -- Neue Folge . -- Vienna: In Kommission bei Eduard Heinrich Mayer, 1912. 28. Lick Observatory . Observatory Atlas of the Moon . -- [Sacramento? ]: Published by the gift of W.W. Law, 1896-1897. 29. Observatoire de Paris . Atlas Photographique de la Lune / Ex cut par M. M[aurice] Loewy et M. P[ierre Henri] Puiseux. -- Paris: Imprimerie Nationale, 1896-1909. 30. Weinek, Ladislaus (1848-1913). Photographischer Mond-Atlas, vornehmlich auf Grund von focalen Negativen der Lick-Sterwarte in Massstabe eines Monddurchmessers von 10 Fuss ausgef hrt . -- Prague: Verlag von Carl Bellmann, 1897-1900. 31. Ritchey, George Willis (1864-1945). "Celestial photography with the 40-inch visual telescope of the Yerkes Observatory," in: The Astrophysical Journal , vol. 12, pp. 352-360 and plate XXI, "Lunar Crater Theophilus and Surrounding Region." -- Chicago: The University of Chicago Press, 1900. 32. Pickering, William Henry (1858-1938). The Moon : A Summary of the Existing Knowledge of our Satellite . -- New York: Doubleday, Page & Company, 1903. 33. Fauth, Philipp (1867-1941). Astronomische Beobachtungen und Resultate . -- Kaiserslautern: Aug. Gotthold's Verlagsbuchhandlung, 1893-1895. 34. Elger, Thomas Gwyn (1838-1897). The Moon: A full Description and Map of its Principal Physical Features . -- London: George Philip & son, 1895. 35. Goodacre, Walter (1856-1938). A Map of the Moon in XXV Sections . -- London: Published by W. Goodacre, 1910. 36. Fauth, Philipp (1867-1941). Neue Mondkarten und neue Grundlagen einer Mondkunde auf 16 Tafeln . -- Gr nwald bei M nchen: Philipp Fauth, 1932. 37. Pease, Francis (1881-1938). "Photograph of [lunar] Surface," facing p. 315 in: Goodacre, Walter . 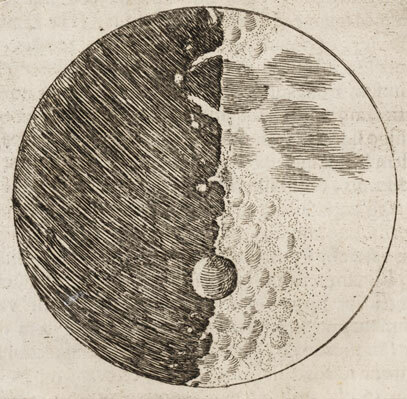 The Moon, With a Description of its Surface Formations . -- Bournemouth [Eng. ]: Published by the author, 1931. 38. Kuiper, Gerard Peter , ed. (1905-1973). Photographic Lunar Atlas . -- Chicago: The University of Chicago Press, 1960.